D.I.Y. Option! Customize a diaper cake already "baked" but not yet decorated! This is a great option if you feel creative and want to add your personal touch for the special occasion, but don�t want to deal with the hassle of building a diaper cake from scratch. 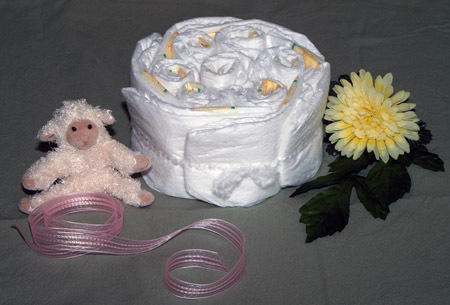 Let us do the dirty work and send you a diaper cake ready for decoration! The undecorated diaper cakes are made from premium diapers and no staples, pins or tape are used, so each diaper is ready for baby. We use a combination technique, rolling most of the diapers for the core each tier to maximize the number of diapers we include and an overlapping finishing layer for an elegant looking cake. No staples, pins or tape are used in the construction of the cake � all diapers are usable!